Yeah I'm talking about Twuora Crunch, a Chrome extension, that is going to crunch on Chrome Web Store. Quora users will then realize how elite they are! :) It is a productive toolbar that appears at the top when you are on any of the Quora pages. 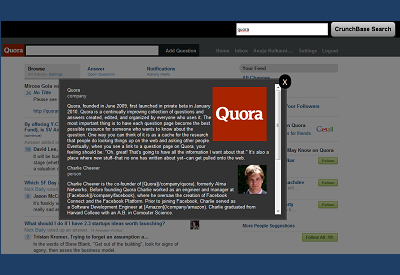 Quora login/home page will have only right part of it - CrunchBase Search. 1. It lets you browse context-based tweets. 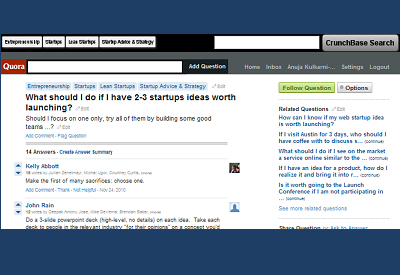 While browsing questions/topics on Quora, this toolbar will display the same set of topics. 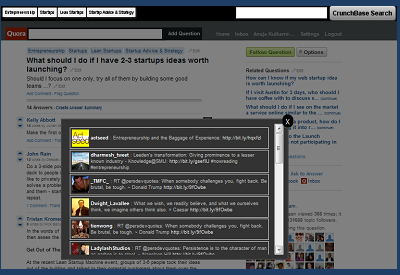 You can click them and browse what people are tweeting about the respective topic on Twitter (without leaving the current Quora page). For example if you are reading answers for "What are some good ways to get new angel investors into the market? ", you can browse real-time tweets on Angelsoft, Investing, Angel Investing, Angel Investors, Startups, Startup Founders & Entrepreneurs etc. 2. Apart from that you can also search in CrunchBase from the same ToolBar.